Para celebrar el Open Data Day, se organizó por parte de TECHO, de la Universidad de San Buenaventura (seccional de de Cartagena) y con el apoyo de Humberto Yances, Miembro del Equipo Humanitario de OSM, un Mapping Party de Mapeo Humanitario de Isla de León. El Taller de mapeo de Isla de León hace parte de las actividades del Proyecto Piloto MAP Cartagena (Proyecto Piloto de Mapeo de Asentamientos Precarios) que nace al interno de la ONG TECHO como un programa de desarrollo comunitario. Isla de León es un nuevo asentamiento de invasión localizado en una zona de inundación de alto riesgo, detrás del barrio El Pozón y colindante con la Ciénaga de la Virgen en la ciudad de Cartagena de Indias, Colombia. El taller empieza con Humberto explicando a los 15 participantes, entre voluntarios de la organización TECHO, de estudiantes de la universidad ey investigadores del tema, que es Open Street Map, como utilizarlo y casos de Mapeo Humanitario en Colombia. A lo largo de la mañana explicó al grupo los elementos y las etiquetas que seríian trabajadas en el mapeo de Isla de León, y cómo se debería trabajar en JOSM. Por la tarde, cada participante empezó a calcar la imagen del asentamiento informal separada en diferentes cuadros, localizando principalmente los caminos y las viviendas. El polígono total de Isla de León fue siendo completado a través del trabajo conjunto de los participantes, orientados por Humberto, que verificaba el trabajo de cada participante antes de subirlo al OSM. Al final del día Isla de León estaba 100% calcada, en base a la foto aérea de BING del año 2012. ELl objetivo ahora del Proyecto Piloto MAP Cartagena es ir en campo generar fotos y datos actualizados durante una visita a campo. In celebration of Open Data Day, local Humanitarian OpenStreetMap Team member Humberto Yances, together with TECHO.org and the University of San Buenaventura organized a mapping party event focused on mapping Isla de León, a slum area in Cartagena, Colombia. The Isla de León mapping workshop was part of the “MAP Cartagena” effort, a pilot project for community development organized by the NGO techo.org to map slum areas. Isla de León is a new informal settlement (slum area) located in a high-risk flood zone area behind the Pozón neighborhood and adjacent to the “Ciénaga de la Virgen” a polluted marshy swamp in the city of Cartagena de Indias, Colombia. The workshop began with Humberto presenting to our 15 participants, including volunteers from TECHO.org, local university students and interested researchers, what OpenStreetMap is, how OSM and open data can be used and examples of humanitarian mapping in Colombia. Throughout the morning Humberto explained the objects to map and the data that would be entered for each object when mapping Isla de León. He also taught everyone the basics of mapping using JOSM, an open source OSM editing tool. In the afternoon, each participant used aerial imagery to map the settlement. The HOT Tasking Manager was used to divide up the area into smaller units to coordinate the tracing. Mappers focused mainly on locating the roads and houses in the settlement. The entire area of Isla de León was mapped through the joint work of the participants, guided by Humberto, who verified the work of each participant before they uploaded it to the OpenStreetMap database. At the end of the day Isla de León was 100% mapped using Microsofts’ Bing.com aerial imagery from 2012. The next objective for the MAP Cartagena Pilot Project is to generate field pictures, both street level and brand new aerial imagery with small UAVs and then update our mapping data. If you are interested in the next phase, please contact us at [nati.dsa@gmail.com]. Future reports from the field will follow! “That you do today is for our benefit tomorrow, with data updated on the map, together with those collected with the tablets, we are going to use it to plan and make decisions” These were the words given by the Chairman of the Board La Boquilla Community, Benjamin Luna, at the closure of the mapping party. 9:00 AM. To my good fortune Internet was familiar among 20 adolescents U-shaped stationed in the Library of the House of Culture, but the next question was not so welcome, none knew about online maps, even popular brands made no sense… The degree of attention was emphasized in the room gradually and peaked when talking about satellites and GPS, was when the aerial photos and the geographic location served as a connection with the maps and their construction process. 10:00 AM. Each team was emboldened to show others its work plan, route, streets, houses, poles, landfills and trade sites that will cover in their respective quadrant of Fieldpapers. Only a small guided outlet on field data collection was enough, to then the teams in competition started in a energic way to capture its first data. In the interim, while waiting for the return of teams, I showed the use of GPS to members of the Community Council, they have two Garmin eTrex units, to which will provide more uses from now. “We need more space for recreation, these vacant lots can better serve the community”. All impressions and ideas were about improving their community were scored on their worksheets. I wrote on the board the URL bit.ly/laboquilla and then teach them how to export map images and so use them in their schoolwork. Next activity will be a workshop to raise OSM data with iD or JOSM editor, which will document in detail all findings. Friday, march 23, 2012. 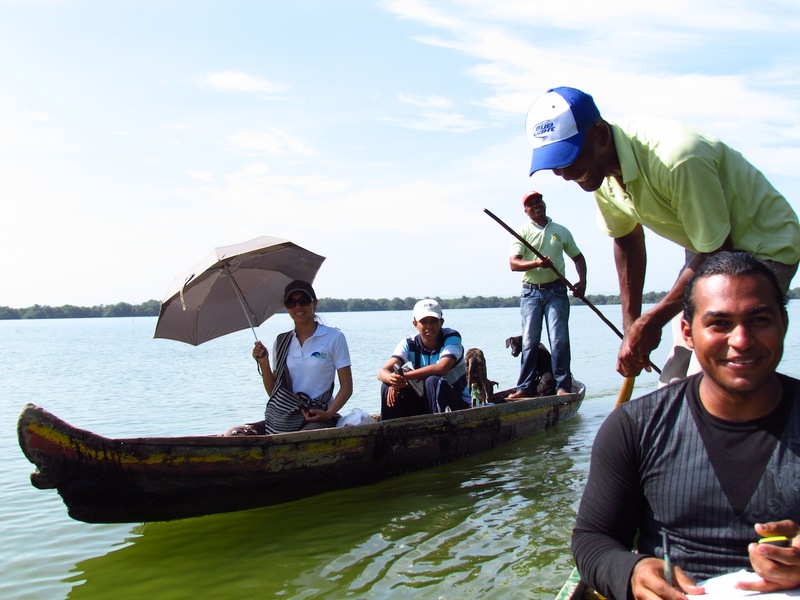 With just one hour of daylight, time when the birds start returning to their nests to be observed, within a picturesque small canoe we were released by the impulse of the rower stick over the waters of the Ciénaga de Juan Polo. Saling into natural mangroves tunnels with particular names like Chagó –onomatopoeic from sound created by walking on shallow water–, “Love” or “Felicity”, gived during the film of a TV serial novel in middle of 80’s. Learning about local species and fishermans culture, in the meanwhile making first traces of sketch for “La Boquilla project”. (This picture was selected as OSM Image of the week) First activity in mind: a participatory mapping workshop with community to create a detailed map of the area, including deforested areas and ecotourism routes into mangroves, then reproject over the map georeferenced pictures, with the winners of near photo contest “Mangrove forest, unprotected treasure”. Saturday, june 9, 2012. After some meetings with community members and inviting Computer Software Engineering students of University of Cartagena, we start planning mapping activity. and I as mapping consultant & HOT member. 1 rower: tourist guide, related stories and local knowledge. At noon, three ecotourism routes were documented and later shared using dropbox folders containing gpx files, pictures and chronics texts. Saturday, june 23, 2012. Two weeks later a mapping worshop is held at Piedra de Bolívar camp of University of Cartagena. During workshop we use canoe gathered data and other data colected by walking papers and Bing imagery, starting with a short introduction about OSM and GIS technology to follow editing traces and tagging with JOSM. Friday, june 29, 2012. The final map was plottered and delivery to the community, a MapOSMatic instance was presented to Community Conceil board in Ecoprogreso office. I exposed about the map creation process and chat with them about map value for territory planning and development. A few months before, La Boquilla receive collective land titulation by Colombian Institute for Rural Development (INCODER), the title was gived to Benjamín Luna, President of Community Conseil by Barack Obama, President of the United States, during OAS’s Sixth Summit of the Americas (in the picture with Juan Manuel Santos, actual President of Colombia). This is one reason why a GIS becomes an important and value tool for this population. La Boquilla problem resume. 200 years ago migrants families comming from San Onofre (Sucre) and Villanueva (Bolívar) settled in this area thanks to the support provided by fishing craft that typically defines the culture of this town. By 1980 modern constrution start, thanks to a new highway for light transport (like cars) between Cartagena de Indias and Barranquilla (other important city in the north coast of Colombia), this bring as a consecuence the lost of hundred hectares mangrove areas, that local people filled to construct new buildings. High income families from other part of the country start buying this buildings to transform it into recreation houses. More recent, national and international hotels chains are buying more buildings and filled areas to arise modern hotels with more than 400 rooms. With a high rate of population triggered by teen pregnancies, poor families forced to move more at north to new areas (Marlinda and Villa Gloria) between sea and Ciénaga de Juan Polo, building huts without water or electricity, deforesting more mangroves and suffering floods. Weak institutions, lack of law enforcement, and society’s permissiveness, that stems from ignorance of the value of the ecosystem. Few schools in the area, low education, sexual tourism, loss of cultural heritage and land conflict, give them low chances for a better human and economic development. It is a complex situation, so we decide to start creating a tool for promote conservancy bewteen local actors, I mean, constructors and people from La Boquilla. With the collaboration of Robin Tolochko, using winner pictures of photo contest “Mangrove forest, unprotected treasure”, this Mapbox interactive map was created. World Environment Day: OSM maps were used during an observation rally with boyscouts pic.twitter.com/LkowJW7A. This activity result as winner of UNEP World Environment Day Challenge 2012 in the category: Best Delivers Effective and Substantive Impact. April 2012. Conservancy Worshops: In company of University Jorge Tadeo Lozano, Ecoprogreso carry out conservancy workshops pic.twitter.com/zVEmHRV8 November 2012. Security ecoturism routes: Ecotourism associations give to police printed OSM map to prevent robbery, during a shameful case involving residents of a neighboring village with international tourists. December 2012. CSR Hotel Capilla del Mar: Mapbox interactive map was published in a CSR website page of Hotel Capilla del Mar. April 2013. OK, we have a mapbox conservancy promotion tool, some map uses, but ¿how to deliver a tool that fit better to help solve the complex problem? So we create the concept project “Social Innovation for Mangrove Conservation”. This mockup summarize the workflow to involve community in advocate activities, creating knowledge from data and information gathered and using it to resolve their enviromental problems. Data gathering: OSM, common land titulation polygon, enviromental measures, etc. Visualization: GIS, Mapbox, stats and infographics. Sharing: Portals, SMS, social networks for citizens and stakeholders communication. Using: Communities of Practice, advocate networks, legal complaints, workshops within universities and for journalists. I'm starting to mapping new towns covered that suffer for floods in caribbean region at north of Colombia. The new imagery give us the possibility to map area remarked as priority by local public authorities. 8 September, 1:30 PM, and a dream near to become true, the plane with just 100 meters from the ground offer a great view of Miami, inner lakes, width streets and suddenly the airport, just immigration process left to be part of this wonderful world conference. I just receive another surprise (based on information of the –well know– process); I feel very welcome to the US, immigration officer have a kind treatment and in just one hour since landing I was running trough airport sections to reach D one and get my connection to Denver. At 8:00 PM I was in International Denver Airport, take the Super Shuttle reserved by OSM that carry me to Comfort Inn Hotel, so just take a relax anxious for starting next day. Just 10 minutes walk from hotel and I was sitting hearing keynote of Richard Weait from Canada. Since this moment start for me this amazing experience called “State of the Map”, there was people near to 40 countries, each one of the with interesting stories, ideas, projects, knowledge, contacts, methodologies, etc. For first time in my life (like OMS mapper) I feel be heard, doesn't sound strange (or idealistic) express ideas to create a geo-alarm networks by SMS to be published into a Ushahidi instance ¿which is the better protocol to has a correct verification? ¿who can support us in Colombia for a possible project? I ask all the time for aerial imagery. I met with another person from Colombia “el hermano colombiano” who was mapping in Afghanistan! Know about institutions that work for a better articulation in crisis situation (before, during and after); that there are a grate, a giant efforts to map in Indonesia; India is developing his own mapping infrastructure; Tunisia government now impulse mapping activities with OSM community; Argentina is getting stronger his community and scientific activities are carried in Philippines with OSM data. I mean, this is just a part of the richness founded into the map conference, I think this is just starting, we have to focus in data quality, one of my ideas (plus “gamification” and automation task) is to incorporate OSM map knowledge into local universities, that is a task that I already started and will follow. In my next entry I'll talk about conclusions after the SotM 2011. After the great joy for announce to be part of scholarships for SOTM 2011, I start the –common know– difficult process to get my visa approved from Colombia. First I receive “hard” training for some of my clients that count with a successful experience, I just learn like an internal mantra: “first my finance; second who I am and; third what I'll do in the states”, with this lessons I just ran to caught all documentation needed with a perfectly match in order of the words expressed in my DS-160 form (following the instructions that appear in a Cosmo review...). So then (taking encourage) I decided to call to US Embassy for an appointment on august 2. My surprise was that they doesn't have schedule space until 9 of September!!! Sir! (I say) But the must important conference around the globe start for the same date, I was voted like number one around the world (Mikael an Sam usually put my email first in the message, I guess that mean number one), I've a letter of invitation of OSM's US National Chapter, I don't know if you can get my appointment and visa for the same day... So the consular officer respond: “let me see if we can find a urgency appointment for you” (beleive me, that was the more anxious 20 minutes of my live with the paradox of a Bach sonata like back-tone). When he come back says “Ok sir, wich day do you prefer: 4, 5 or 7 august” (have to repeat it three times until I get realized), then tells that my time have ending and I need to buy another PIN (what???). 5. State of Colombia map.